What do you imagine when you think of the Maldives? Honeymooners ranched on luxurious holiday homes on stilts? Celebrities boarding their sea planes on route to their private islands? Millionaires laying out on deserted white sands, champagne cocktails in hand? Romance…clear waters…stunning sunsets…. Luxury…Picture perfect, brochure ready, a holiday maker’s paradise? Living in the Middle East I will (probably) never be so close to the Maldives again, or at least never close enough to take advantage of the crazy cheap, budget friendly flights from the region. Should being a solo traveller stop me from experiencing what is clearly marketed very well as a romantic, bucket list destination? Luckily tourism is changing…and dreams of travelling to the Maldives (even as a solo or budget traveller) are now within reach. It seems to be widely understood that the Maldives are ‘sinking’, in a few years they will no longer exist due to rising sea levels. In reality, this is not far off. They are ranked in some of the most endangered nations due to climate change. I better get there quick. 7 days on a traditional Dhoni boat with 7 complete strangers really seems like an easy decision. I was not interested in the Maldives for the fancy resorts and the lazing around, but rather for its beautiful islands, thousands of beaches, wonderful sea life and my general curiosity around other cultures. The opportunity to sail from the north to the south around the atolls, to see how people lived on the very few inhabited islands, to spend my days in the clear, warm waters and my evening revelling in the sunsets and stars. Decision easily made. In brief and at a rough estimate, I was told the Maldives are made up of about 1190 islands, 400 of which serve holiday resorts, 239 inhabit local people and many so called ‘picnic islands’ (uninhabited islands you would visit for a few hours) and sandbanks…and I was about to spend a week sailing around a fair few of them! So, there are good times and bad times to go to the Maldives weather wise. I knew this and still experienced the back end of the monsoon over the first few days aboard our Dhoni. Despite doing my research beforehand, I later learned from our guide that he ‘wouldn’t recommend December’ as a month to take the trip, despite December seeing a surge in tourism over the Christmas period. Don’t get me wrong, the monsoon didn’t ruin my first 2 days. It only enhanced my experience (luckily, I don’t suffer with sea sickness). 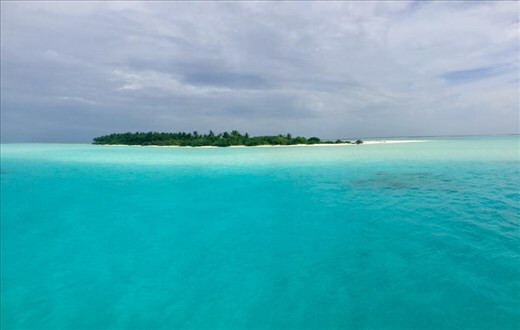 The views from the deck with the grey, grumbling clouds and impending rain hanging over the white atolls and turquoise waters made for some stunning scenes. The rain would come quick and fast whilst we were dosing on the top deck…and sun would pop back out within 10 minutes. During those first 2 days sailing south down Felidhe Atoll, despite the rain we managed several snorkels. I saw my first mantaray (which was a lot bigger than I expected!) and several turtles. The seas were rough, and the water was cold, and we ate breakfast in the rain…I didn’t care and neither did the dolphins who joined us on the mornings. After that we saw no more grey clouds, and certainly no kore rain. The following mornings we woke up to sunshine and the Maldives began to look how I expected, how I’d seen it in brochures and on TV adverts. The sun reflected off the bright white sands and the sea no longer looked dark and choppy, but clear and calm and fish swam just below the surface. Every morning little dolphins would jump around at the front of the boat, showing off for us. The crew caught a huge Mahi-mahi which was bbq’d and eaten for dinner at a dug-out table made of sand on an uninhabited island. After, we swam with phosphorus plankton, the little shimmers and sparkles lightening up with the movement of our bodies. We were cruising south and stopped for a visit at Rakedhoo, a small local island with a tiny population. The Maldives is an Islamic country that lives by Islamic law, as such I guess it’s worth mentioning if you want the freedom to drink alcohol and wear a bikini in the Maldives, then you need the privacy of a pricey resort, or to consider the option of boat trips, although I did go a whole week with no Wi-Fi. Good for the soul. The communities on the inhabited islands are small, with few shops, mosques, schools or medical facilities. Inhabitants work for small family run businesses or move to Male where there are more opportunities, both in education and then for employment and apparently rarely go back to their islands after leaving. Some are now opening small, affordable guesthouses as family run businesses on the slightly bigger islands. The Maldives are starting see a move away from the luxury price tag tourism of previous years. We managed to catch a traditional drum and dancing show one evening and on our way back to the boat saw about 25 stingrays all swimming close to the shore. I learned that stingrays are really friendly, curious creatures. If you put your hand in the water they will swim very close and you can stroke under their wings, needless to say this occupied most of my evening that night. I wish I could remember all the names of all the fish, but for me, the names don’t matter. We snorkelled at least twice a day every day with a guide who was familiar with the corals. The sights were extraordinary, schools of fish big and small and turtles swimming around us…even reef sharks. I’ve been fortunate to do a lot of snorkelling, and a bit of diving….but the snorkelling in the Maldives was truly some of the most beautiful I’ve seen, and the beaches…some of the best I’ve ever laid upon..and I’ve laid upon a fair few! Tourism in the Maldives is changing, and along with the rest of the world is becoming so much more accessible to those who want to go out and get it.